Google Voice is a great communication tool, no doubt. Now, how can make it even more easy to access and use? GV Mobile iPhone app makes it easy to use it from your iPhone. But, i just came across a cool tool that puts Google Voice in your desktop taskbar. GVNotifier.NET is a free Windows desktop client that neatly tucks away in your taskbar. You just click on the GVNotifier icon to pull up a windows wherever you need it. GVNotifier comes up with a list of contacts from your recent contacts. 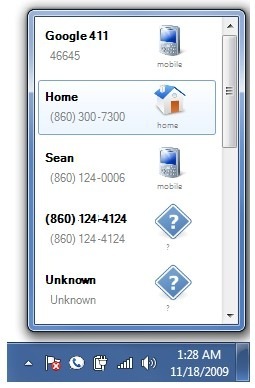 Click on a contact to bring up a small screen with an option to call or send SMS. 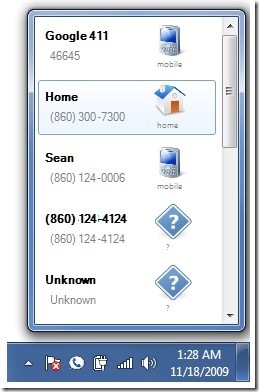 You can also right click on the icon to directly enter a phone number. When you receieve a SMS, it just pops up a little window where you can read the SMS as well as send a reply right away. The app is very easy to use and is simplistic. Don’t mistake it for a full blown Google Voice client. It is not. It is a Google Voice Notifier app that makes it easy to interact with Google Voice. Think Gmail Notifier for Google Voice. Do you have a Google Voice client suggestion you would like me to cover here? Leave a comment and I will be happy to. Been using gvnotifier.net for over a month and like it. Recently noticed my entire messages weren’t being sent, despite being 160 chars or less. I just figured out that anything after the ‘&’ sign is truncated.. Not sure if other special characters do the same thing.